survival, emergency preparedness, prepper, survivalist, everyday carry, emergency kit: Where to get your rations before s*** hits the fan? At Costco of course. Where to get your rations before s*** hits the fan? At Costco of course. For about $1000 (includes shipping and handling) you can stock up your bunker/pantry for emergencies with enough dehydrated and freeze-dried food to last 1 person 1 year. For 2 people - about 6 mos. For a family of 4, about 3 months. 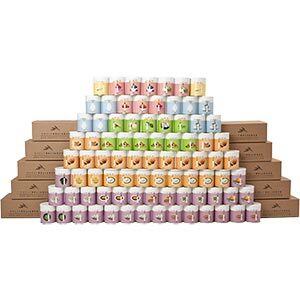 This THRIVE 1 Year 1 Person Food Storage package contains 84 #10 (gallon size) cans. See below for specific package contents. Side note: I know this is meant for emergency preparedness but it seems like a good overall investment for other situations. Think about it - $1000/ year of food for 1 person, it breaks down to roughly $76/month of food - 1 person. It's actually less because the actual cost of the food is $800, the rest is shipping & handling. I've been reading through the reviews and it seems like it's getting a good reception. As for me. I can live off of pasta and noodle bowls so I'm good. It's better than having to eat Soylent Green eh?